As the winter weather finally rolls into Fort Collins, it may be time to spend an evening or two enjoying some family entertainment. As you plan out your night’s entertainment, why not investigate some films with a local connection? Sure you could schedule a film festival featuring locally born actors Jon Heder or Jake Lloyd, but how many time can you watch Napoleon Dynamite or Star Wars, Episode One: The Phantom Menace? To really enjoy your movie watching experience, I suggest taking a look at some of the work of our very own Harper Goff. If the name doesn’t ring any bells, you’ll probably still recognize some of Goff’s contributions to popular culture and entertainment. 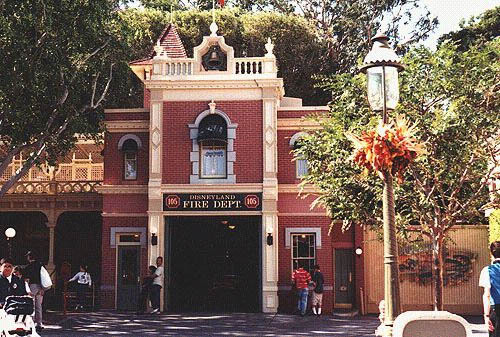 Harper Goff drew heavily on his childhood memories of growing up in Fort Collins when he helped design the look of Main Street, USA in Disneyland. 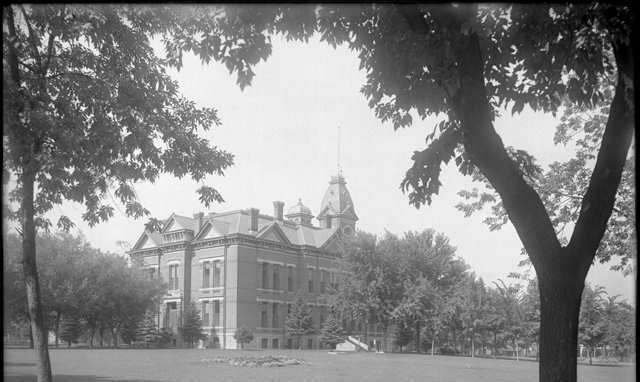 Certain buildings were influenced by the design of historical Fort Collins structures, including Disney’s Town Hall, which is patterned after our now demolished Court House building, and the Disneyland Fire House, which shares design features with our old Fire House located on Walnut Street. Before joining the Walt Disney Company, Harper Goff was employed at Warner Brother’s Studios where he had served as an artistic director and set designer for such classic films as Casablanca, Captain Blood, Sergeant York, and the 1935 production of A Midsummer Night’s Dream. For Walt Disney, Harper Goff is perhaps best remembered as designing the film look of 20,000 leagues Under the Sea. His iconic Victorian era diving suits and the Nautilus submarine would go on to win the Oscar for Best Art Direction in the 1954. Unfortunately, Harper Goff was not allowed to accept the award. Goff wouldn’t become a member of the Art Director’s Union until later in his career and, as a non-member, was inelligible to win. Instead, John Meehan, who had simply carried out Harper Goff’s amazing designs for 20,000 Leagues Under the Sea, was given the award. Harper Goff would later be credited for Creative Production Research on another submarine based film, Fantastic Voyage produced in 1966, featuring a stunning journey through the human body aboard the miniaturized vessel, the Proteus. That film also won the Oscar for Best Art Direction. In 1971, Harper Goff would create the look of the original film adaptation of Roald Dahl’s Willy Wonka and The Chocolate Factory, featuring Gene Wilder. Goff also had some on screen appearances over the years in television series such as Dragnet, and in films like Hit Parade of 1951, and Pete Kelly’s Blues. You can find a complete filmography on the Internet Movie Data Base. While occasionally appearing as an actor, Goff earned most of his screen time as the banjo player for the Fire House Five Plus Two. A musical act comprised of Disney artists, the band appeared on many specials and variety shows. Check out Harper Goff’s toothsome grin in this clip with the band performing Everybody Loves My Baby. If it doesn’t get your toes tapping on a cold winter’s night, then nothing will. Earlier this morning, Fort Collins Mayor Doug Hutchinson stood on the west steps of the Museum to announce some exciting news: Fort Collins has been chosen by the National Trust for Historic Preservation as one of their dozen “Distinctive Destinations” for 2010. The communities recognized by the National Trust are characterized as offering an “authentic visitor experience by combining dynamic downtowns, cultural diversity, attractive architecture, cultural landscapes and a strong commitment to historic preservation, sustainability and revitalization.” Yup, that’s us! Fort Collins is frequently recognized for its beautifully preserved historic architecture — you’ll hear this a lot around here, and it’s true: “Main Street USA” at Disneyland was modeled on our very own Old Town. 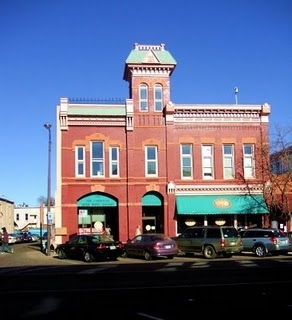 There are over 1,800 historic properties in Fort Collins that are on the national, State or local historic register. 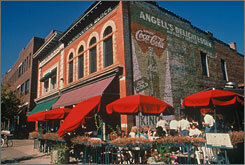 Fort Collins is not a very old community, but we’ve worked to preserve our heritage as a city, albeit a “young” one. The National Trust also gave us enthusiastic nods for our “active living” and our longstanding sustainability efforts. And our beer, too, of course. But the phrase that popped out at me was “cultural landscapes.” To me, this is our most shining, if also least known, jewel: our literal “cultural landscape” is over 12,000 years old. Historic preservation is mostly about structures — the “built environment.” Around here, the built environment reflects less than 2% of the total time people have lived in this area. For the rest of that time, landscape and culture were deeply interwoven. The histories and traditions of the people who lived here over the millennia were encoded in the prairies, rivers, hills, plants, animals, earth and sky. If you’re familiar with the Soapstone Prairie Natural Area, you know that Ice Age peoples left ample evidence of their lives at the Lindenmeier Archaeological Site. You may not know that stone tools created by even more ancient people were discovered in a farm field in Timnath, just east of Fort Collins. This Clovis cache resides at the Museum today. Folsom tools have been found not far from where the CSU Rams play football on fall afternoons. This story is a harder sell — no wonderful old trolley cars or sandstone buildings to point to. Lots of stone tools, yes, but so much we don’t know about them. The people who could have told us the stories written on the prairies, rivers, and hills were driven off long ago and much of that precious information has been lost forever. But this is the essential underpinning of what makes Fort Collins a “Distinctive Destination,” this deep cultural taproot that has grown so vigorously in this amazing landscape. I hope it’s a story people will continue to be curious about as they explore this marvelous community. And don’t miss this: you can vote for your favorite of the 12 “Distinctive Destinations.” Vote early, vote often, vote Fort Collins! From the Archive: Mouse ears for the inmates! One Fort Collins resident is anxiously awaiting to hear if she has won a trip to California, a new car, or cash. What makes her different is she is Mrs. Larimer County Jail. Is the county jail a “missus” or even a woman for that matter? According to McCall’s Magazine’s latest sweepstakes contest, she is both. While the jail staff isn’t sure if they will actually enter McCall’s contest, one thing is for sure. The cold steel bars will never be the same. I scrolled ahead a few weeks through the microfilm, and it looks like Mrs. Larimer County Jail never won that trip to Disneyland. It’s too bad, really; I bet she would have loved Pirates of the Caribbean.